Its that time of the month again- time for a new playlist! This month's uptempo playlist is inspired by the warm weather here in San Diego. It may be spring but it feels like summer here in San Diego. The month of may included some great releases but the most talked about release by far was Daft Punk's long anticipated album, Random Access Memories which is simply perfection. 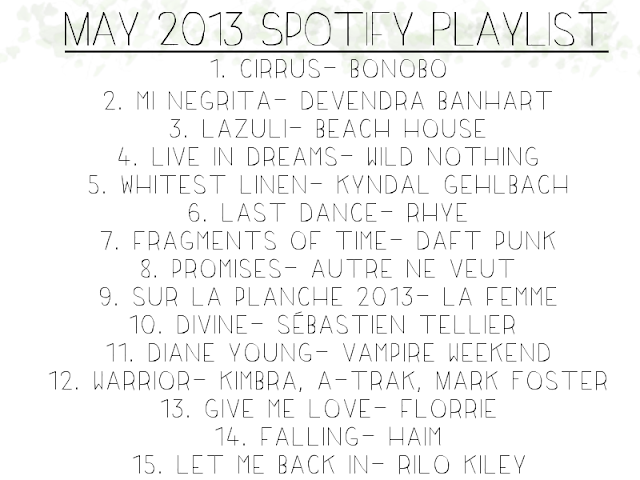 In the playlist I also featured some lesser known artists like Kyndal Gehlback, Autre Ne Veut, and La Femme. My May favorites are finally here! Find out what products I've been loving in my video below. It may not be a lot but I'm sure you'll find my video entertaining or at least a little random. Neon colors seem to make a comeback pretty much every spring/summer. They're loud, in your face colors. While I'm not a big fan of wearing neon clothing, I do love neon accents here and there. A good and opaque neon polish can be tough to find. Most of the time you have to do one coat of white polish to make a neon polish appear opaque but this isn't the case. With two coats of this polish I was able to get the most perfect neon orange nails. Call me crazy but I think this is going to be one of my favorite nail polishes of the summer. I'm definitely one of those people who are not afraid to change up their look. I've had my hair pretty much at every length and also dyed plenty of times since high school. If you follow me on Instagram or Facebook you already saw my latest haircut, but for the rest of you, this is now my hair. After years of wanting to get a pixie cut, I finally got the courage to sport the short hairstyle. Why the sudden change of heart? Shop my closet with Poshmark! A few weeks back I got the chance to attend the "Sunshine Style" Posh Party at the W Hotel here in San Diego which was hosted by one of my favorite San Diego bloggers, Paulina from Lil Bits of Chic. The event itself was very fun and I loved getting the chance to meet other bloggers from San Diego. I also got to learn more about the Poshmark app from users and Maria Morales from the popular blog Kitties + Couture who works for Poshmark. I am finally done with my undergraduate degree! If you can't tell by how often I tweet and Instagram something about Paris or France, I majored in French and Francophone Studies and minored in European Studies from SDSU. These past five years haven't been easy but I enjoyed them. If you want to read more about what life as a French and Francophone Studies major was like just read my blog post on my study abroad blog. For the special occasion I decided to go with my school colors, because... why not? Might as well go out looking good. Hope everyone is having a great weekend! I'll see you all very soon in a new blog post.